Given the choice, I always prefer to hold requirement gathering sessions, trainings, etc in person. However sometimes schedules, deadlines, and travel don’t always come together and you are forced to hold those sessions remotely. In the absence of a high end video conferencing system with multiple wall-mounted cameras that change views or follow the speaker via remote control or wall buttons (they exist and are a pretty awesome! ), remote meetings where video is required can be pretty painful. Facing that situation this week, I was trying to find a solution that would allow for switching between multiple white boards while not having the unflattering waist high laptop on a desk with a slight upward angle view. Thinking about my options, I realized a simple desk chair was my solution! I placed my laptop on a desk chair, adjusted the angle to be just right for my whiteboards and boom, a brilliant meeting hack was born. 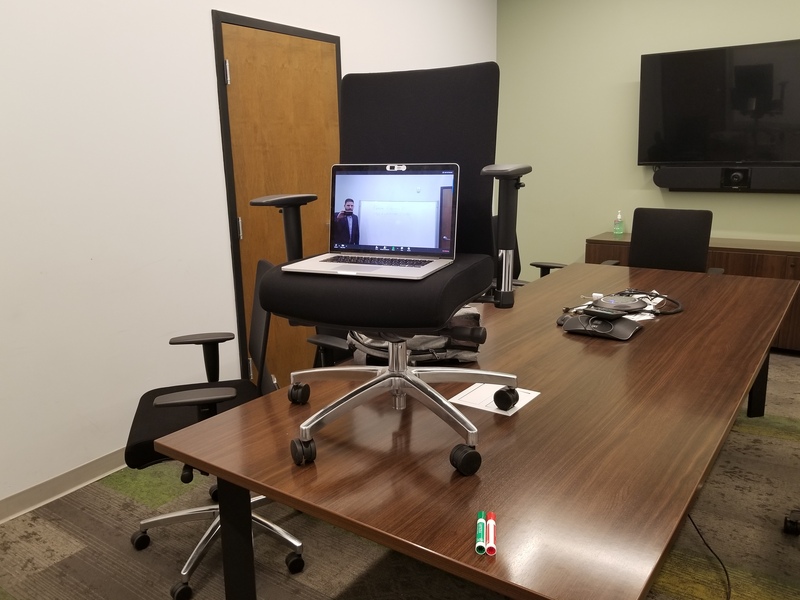 The other party in this meeting said, ‘Oh wow, that is a really cool camera system you have’…if only they knew our fancy camera system was really a Staples office chair on top of a desk! The requirements gathering session went really well, with everyone sharing their cameras and being able to quickly shift between boards, there was little lost by not being in person. Bonus Tip: Wear a bluetooth earpiece or ear buds with a mic and dial into your meeting from your phone, so you have the audio directly in your ear and your voice is clear on the audio feed.